Do you long for the warm, cozy feeling a fireplace brings to a home, but wish to avoid the hassle of hauling wood, coaxing a flame, and shoveling ashes? Do you have a fireplace but not a working chimney? Are you worried that a wood fire could be a danger to young children? Gas logs are the solution to these and other common problems with fireplaces. Gas fireplace inserts can accommodate nearly any type of fireplace, including vented and vent-less options. Natural gas or propane can be used to fuel the flames, making it possible to start a roaring fire at the flip of a switch or the push of a button. A fireplace is often the focal point of a room. People gather around fires for the warmth and the beauty that it offers. A fire draws people in, including curious young children. Gas log inserts can be installed with safety features such as doors that do not get hot to the touch and safety pilot lights that are easily lit by adults. There is never a concern that sparks or embers will escape or that logs will roll out. Chimney fires are not a concern with gas logs, as there are no coals or ashes to blow up the chimney. No chimney sweeping is necessary. Your home and your family can warm up safely by a gas log fireplace. If you or anyone in your household suffers from allergies or any other respiratory illness, gas logs are a much healthier option than burning wood. Gas logs burn clean, especially the vent-less variety. Vent-less gas logs do not require a chimney or any other type of ventilation, as they burn clean and emit very little or no exhaust. Vent-less gas logs produce significant warmth that can help take the edge off the cold on a winter day. Vented gas logs require a chimney or other ventilation avenue, and are often installed in fireplaces that are capable of being used for burning wood. Vented logs do produce some exhaust that has to be vented outside of the home through the existing chimney or flue. Vented logs use a bit more gas than vent-less, but both are still more economical than a wood burning fireplace when used on a regular basis during the cold season. Wood burning fireplaces produce smoke, soot, and carbon monoxide that are released into the air inside your home. This affects the indoor air quality in the home, which can irritate allergies, asthma, and other respiratory illnesses. It is always wise to have a carbon monoxide detector installed in your home, regardless of the type of fireplace you choose. 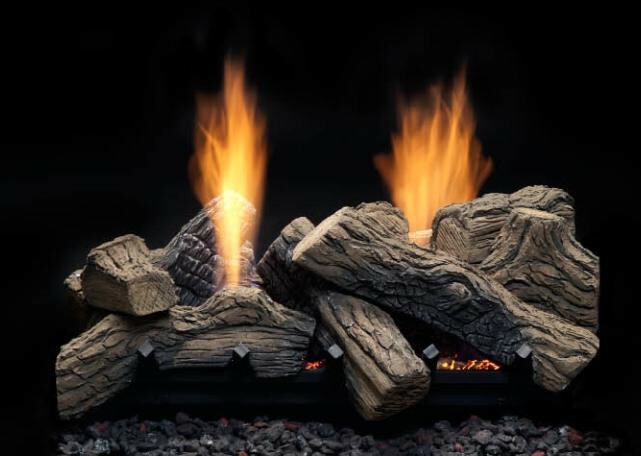 If you are tired of chopping wood or cleaning out your fireplace, we would be glad to help you decide on the perfect set of gas logs for your fireplace. Whether supported by natural gas or propane, we can install gas fireplace inserts at your convenience in the Greensboro, Burlington, Eden, High Point and surrounding areas. Our natural gas and propane logs look very realistic, complete with glowing embers underneath for the full effect. Enjoy the warmth and beauty of a crackling fire with your family and friends at the flip of a switch. Feel free to stop by our office where it would be our pleasure to give you a tour through our gas log showroom. We have a wide variety of both vented and vent-less gas logs that can fit almost all fireplaces. Call us today to speak with a representative about adding warmth and ambiance to your home with gas logs: (336) 273-8663. Please fill out the form below, and one of our representatives will contact you shortly to discuss your gas log needs. IMPORTANT NOTE: Safety is one of our major responsibilities in the fuel business, and it is true that many consumers try to install their own gas logs without compliance to local ordinances, regulation, or inspection. We strongly advise you to give us a call before putting you or your family at risk. Our staff is glad to assist in any decisions you have to make in regards to a new set of gas logs.